John Michael Osbourne, born in 1948 and better known as Ozzy Osbourne, has had a musical career to this day that could hardly be more impressive. Ozzy Osbourne became known as the lead singer of the heavy metal heavy rock band Black Sabbath. For a long time, the four Britons were considered the most evil that music produced. While Osbourne's drug excesses became more and more excessive until the end of the 70's, his band colleagues decided to throw him out of the formation in 1979. 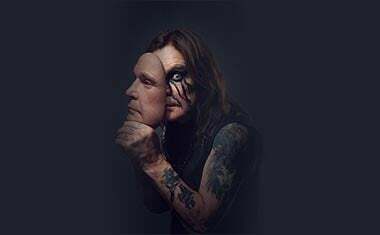 After a few dark months, Ozzy decided, also thanks to the support of his later wife Sharon Ardon, to perform as a solo artist. In order to get his solo career off to a flying start, Ardon arranged an appointment for the singer in a show on TV station CBS. The performance - so the idea - was to be extraordinary, which is why Arden recommended him to take three white doves with him and to release them during the performance. Osbourne, strongly alcoholised during the performance, sits on the lap of a lady present, lets two birds fly and bites off the head of the third. This episode is as much a part of the Ozzy myth as the consumption of a bat's head at a performance in 1982, ending with a rabies vaccination in hospital. At this point, however, Ozzy is already at the top again. Although he is banned from CBS for the time being, the released record "Blizzard Of Ozz" was a success. With "Crazy Train," Goodbye To Romance" and "Hey, Mr. Crowley" she contains three of his greatest solo hits. From 1980 to the mid-1990s, the musician collected several platinum awards and established himself as a solo artist. Besides his financial success as a musician, Osbourne also earned the nicknames Godfather of Metal (Godfather of Metal) and Prince of Darkness (Prince of Darkness).